This year’s downtown holiday celebration takes place from 5 to 9 p.m., Friday, December 6 on The BLVD, between 10th Street West and Sierra Highway in Lancaster. 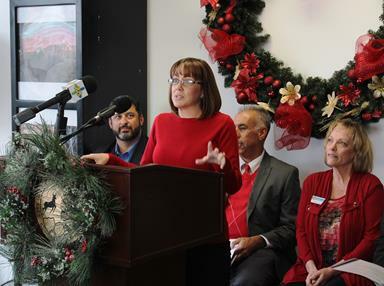 Lancaster’s Parks and Recreation Director Ronda Perez announces details of the event at a press conference Tuesday (Nov. 19). Evening festivities will include carolers, musicians, arts and crafts, an outdoor movie and the Holiday Train Express. New this year is a children’s sledding area created with real snow. A lot of tasting opportunities will also be in store, with BLVD restaurants and outdoor food vendors serving up comfort cuisine and cool-weather delights, such as hot chocolate and roasted chestnuts. This is also the perfect time to shop for the holidays at The BLVD’s boutique shops and the ever-popular Christkindlmarkt, which will feature crafts, homemade goods and a farmers market. The city of Lancaster invites residents to come and experience the magic of the season on Friday, December 6, from 5 – 9 p.m., at the fourth annual A Magical BLVD Christmas, where the joyfulness of the holidays will light up the streets and fill the air in downtown Lancaster. View sights from last year’s event at: Sights from ‘A Magical BLVD Christmas’! 9 comments for "Countdown to “A Magical BLVD Christmas”"
Just moved to Lancaster for a life change with the kids looking forward to visiting and getting to know the new neighborhood cant wait . . .
Good for you! The downtown is pretty cool. Just use common sense and you will be just fine. A lot of money , time and energy spent on some made up magic. What about the magic of helping the homeless? Who is making room for the homeless and very needy. Other than the small shelter that is open part time I wonder who is keeping the homeless warm? I have not seen or heard a word from the Rex about keeping the needy and homeless of the city warm and housed, no room in the inn. Please do not tll me that Grace and Mr. Baker is taking care of everyone because he is stretched beyond limit. There are many huge empty buildings in Lancaster, the old Costco building, that could be made into promising boarding homes, open fulltime, a home that a person could stay in. I don’t want that in my backyard. How much am I going to make on that? How much is Rex making from his business on the boulevard? Happy Holidays……….. When commenting on the homeless why don’t people realize that there are a significant number of them that will not go to a shelter regardless of how many there are and how accessible they are. There are usually rules, no drugs or alcohol etc, that they choose not to want to comply with. You also cannot force mental health care on them which is too often their problem. If you have a executable plan to get all of the homeless into shelters please share. Throwing money at something does not fix it, just look at our schools. This will be great for my child. Grandma is going to have to take her. I’m out of town indefinitely, thousands of miles away. On a friday?? I work out of town … I guess we won’t be going this year. The Magical BLVD Christmas is on the Friday night before the Christmas Parade Saturday morning. I think the idea is that it will reduce the disruption to businesses and traffic by having both the Magical BLVD Christmas and Parade on the same weekend. The decision was made in part based on feedback from area businesses.